That's right, here in Canada, this is Thanksgiving weekend. Thanksgiving Day is actually tomorrow, I do believe. At least that's what the calendar says. Wait a minute. Let me check on that. Be right back. Okay, I'm back. Yup, that's what it says. The calendar says that tomorrow is Thanksgiving Monday but only here in Canada. Nothing marked for today although I know a lot of Canadian cats and peeps are having the big special dinner this evening. Lots of peeps will be travelling tomorrow, I suppose. Maybe that's why they do the dinner on Sunday. When I was checking the calender, I noticed that tomorrow is also Columbus Day in the United States. Actually, I already knew that. Bet most cats do. Bet most peeps do, too. But did you all know that tomorrow is also Health and Sports Day in Japan? I never knew that before but it says so right there on my calender so it must be true. I would imagine that on a day called Health and Sports Day, cats and peeps should be active. Celebrate being active, in fact. Lots of peeps here in Canada will go out walking or hiking tomorrow, I suppose . If you have good weather and the day off, why not? That's healthy. It's kind of sporty, too. I think I'll encourage my peeps to have a fun-filled afternoon of wand toys and nip mice with me. Maybe toss a ball around. I always enjoy watching the peeps go fetch the knitted ball they throw to me. You know, after I totally ignore it. Ah yes, good times, for sure. Oohhh.. and then there are the turkeys. I've been hearing an awful lot about turkeys leading up to Thanksgiving weekend and from what I've been hearing, some of those turkeys are pretty darned big. Cooking turkey dinner could be a sport in of itself, don't you think? Kind of like lifting weights for cooks. MOUSES! For all I know, eating turkey dinner might be a sport for some, too. MOUSES! At my house, the turkey all comes in tins and they're never all that heavy. Well... individual tins aren't very heavy but I suppose that if Peep #1 were to go around lifting whole cases of those tins, it could be considered a sporting event of some sort. I'll have to check the facts on that and see if it's something we could get into the Olympics. If so, I bet Peep #1 could win, for sure. We give her lots of practice, you see. Of course we cats would continue to provide practice opportunities, for the peep, by eating the turkey in those tins which would require her to go back to the store to get more. More tins. More athletic training, for sure. MOUSES! Anyone know if the Olympic gold medals are made of real gold? I'm wondering because if we cats were to help the peep out by eating the tinned turkey so that she could win a medal for lifting the tins of turkey and giblets, we cats would be entitled to some of that gold, would we not? And we could use the gold from that medal to buy us a real turkey dinner. In case you were wondering about these tins of turkey and whatnot, let me explain. My peeps are vegetarians. 'Nough said. MOUSES! That's enough about turkeys. Now let's talk pumpkin pie. Peep #1 made pumpkin pie yesterday. Oddly enough, the pumpkin for the pumpkin pie came in a tin, too. Just like our turkey. You think it might be turkey? MOUSES! Nope, Ol' Peepers here says it's not. She says it's one hundred percent pumpkin. At least that's what it says on the tin. Ever wonder why the tins of pumpkin say they contain one hundred percent pumpkin? Ever wonder that? I mean, what else would they contain? Squash? This just in... BREAKING NEWS... Apparently, some tins of pumpkin do contain squash. MOUSES! But back to that pumpkin pie. You know, the one the peep made, yesterday. It's in the fridge right now but I'm thinking, it's going to be coming out later today and when it does, I'll be waiting. To tell you the truth, I'm not overly interested in the pie itself. I know a lot of cats enjoy a little pumpkin now and then but really, I'm not one of those cats. And although I personally witnessed Peep #1 adding whipping cream - which I love - to that pie, I also personally witnessed her adding a whole bunch of spices like cloves and nutmeg and cinnamon. And it gets worse. She also added... wait for it... orange. ORANGE. Could you believe it? MOUSES! For your information, Peepers, we cats do not like oranges. Don't like anything citrus at all. MOUSES! But I'm betting she'll be whipping up some additional whipping cream to go on top of that pie and when she does, I'm gonna be there like cheese on a nip pizza. I'm gonna snag some of that cream, for sure. I know, I know... I know what you're thinking. You're thinking, we marmalade cats were cut off from the cream when Anderson was knighted Sir Fartsalot. Lactose intolerance, you see. Well you'd be right about that but I'm right about something, too. What I'm right about is that what the peep doesn't know, won't hurt her. If the peep doesn't see me getting the cream, she'll never be any the wiser. Of course, this does not apply to Anderson. Andy can't have any cream. Peep might not see him lapping up the cream but sooner or later, she'll smell him, for sure. We don't call him Sir Fartsalot for nothing, you see. MOUSES! What the peep doesn't know, won't hurt her... Remember this, kitties. Remember it well. Comes in handy when a fur-sib brings a dead mouse or something into the house and deposits it on a bed. As long as you get that corpse out of the house before your peeps see it, you'll be okay. Comes in handy when you bring in a dead mouse or something, too. MOUSES! Not that I've ever done any such thing. Never done anything like that at all. Why... Uh... I... Ummm... Never mind. MOUSES! But turkeys and pumpkins and tins of pumpkin-impersonating-squash aside, THIS IS THANKSGIVING WEEKEND, a time for being thankful, for sure. So count up your blessings and recognise that those blessings are all things for which we should be thankful. I'm thankful for the fact that even though I won't be having a real turkey dinner on account of my peeps' vegginess, I will be having the kind of turkey that comes in tins along with their giblets, whatever those are. I'm kind of thankful I don't actually know what giblets are, too. And I'm thankful that even though Peep #1 totally ruined the pumpkin pie by adding those icky spices and orange to it, there will still be some uncontaminated whipped cream for me to snag when she's not looking. I'm also thankful for having a warm place to sleep at night where I'm safe and I'm loved. And I'm thankful that my fur-sibs are basically pretty good fur-sibs to have. And I'm thankful that even though nosy-neighbour-cat has been hanging around my house a lot as of late, he does have his own home and family and I'm thinking he'll be spending Thanksgiving with them. I'm thankful for this wonderful planet we all share, called Earth. Thankful for clean air and clean water and lots of pretty scenery. For soft breezes to feel on my nose and for the rustle of leaves I can hear under my paws. And talking about leaves, they're beginning to colour up nicely and I'm ever-so-thankful that I get to enjoy them at this time of year. But most of all, I'm thankful for my peeps. They're pretty good peeps, I should think. Oh sure, they could be better. There's always room for improvement, you see. I've even given them lists of suggestions for areas where improvement might be needed but apparently, my peeps have selective reading skills or something because so far they've taken none of my suggestions to heart. But by and large, as far as peeps go, I think they're pretty darned good, for sure. Well acceptable, at least. And of course, I'm thankful for all of you. I'm thankful for each and every one of you who read my blog, twice a week, every week. I'm thankful for any of you who just drop on by, occasionally, too. I'm thankful for getting the chance to know you and thankful that you have chosen to be my friends. And I'm thankful that you have accepted my friendship in return. I am thankful that together, we can all be one big happy family and when it comes to Thanksgiving, family and friends is what it's all about, for sure. So HAPPY THANKSGIVING EVERYBODY! May you spend this weekend surrounded by loving family and friends and may you all enjoy many Thanksgivings to come. Happy Thanksgiving pal. It's nice to see you again. I know, I've been missing. Same ole story over here - it's all M's fault. So happy turkey eating and pumpkin pie/errr squash pie eating. Turkey sounds good to me but I'll pass on the pumpkin and squash. I was aiming on getting myself some of that cream but it turns out, if I wanna get away with stuff, I shouldn't blog all about it and give the peeps a heads up, if you know what I mean. MOUSES! Happy Thanksgiving to you and your family. We won't celebrate until the November. You have fun with your peeps tomorrow. Happy Thanksgiving to all of you! That is a nice bunch of things to be thankful for indeed. Hey, yes the Olympic gold medals are made of real gold. The U.S. winners have to claim them as income unless congress gives them a pass. Happy Thanksgiving to you and your family, Seville! Bummer that you won't get a real turkey of your own. 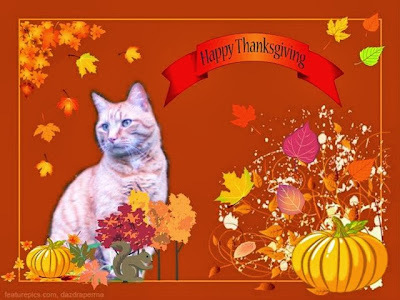 I don't know what my human's doing for the U.S. Thanksgiving next month, but I hope it involves bringing home turkey for us cats! Would be even better if she could bring ME! I hope you and your peeps have a mighty wonderful Thanksgiving weekend - we're thankful every day of the year of course for all the goodies and happies we have but especially on days like these when the whole family celebrates. We had great weather and lots of loving up. It was wonderful! Of course, Andy got kissed on the nose. Still recovering from that honestly, I think he's going to survive. MOUSES! Happy Thanksgiving Seville, to you, your fursibs, and your peeps too! We don't always get to come by (our mom bean being slightly less than helpful that way), we always enjoy reading about the goings on at your house. Pee Ess: Enjoy the whip cream! I have peep problems, too. As you know, Peep #1 is a technologically impaired duffer. I'm thinking of having her certified. MOUSES! They followed him home? MOUSES! I did however... it came out of a tin. MOUSES! Excellent post- you deserve some cream for that. If it upsets your tummy- blame Andy :) Happy Thanksgiving. I am impressed that your peeps are vegetarians, I tried, but my hubby wouldn't join me and it was too hard to still make him meat. This all happened many moons ago, before I was even born, but I am told it happened something like this. Peep #1 went veggie first. Peep #2 was informed that Peep #1 would cook meat no more. And that, my friends, was that. MOUSES! Great post, Sev. Even the part about your Peep ruining a purrrfectly good punkin pie wif oranges. I'm blessed to have you for my Bestie. Happy Thanksgiving to your whole family. Purrs! Seville, we hope you had a great Thanksgiving - with lots and lots of tinned turkey. Which reminds Us - haven't you effur wondered how they get those huge turkeys into those tiny little tins? I have, in fact, and to tell you the truth, I haven't got a clue. MOUSES!